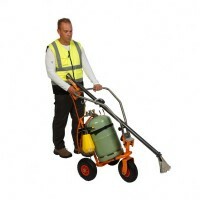 The RIPAGREEN® kit comprises 2 separate components which are both essential for efficient operation. The RIPAGREEN® trolley carries the gas cylinder, thermal weeding lance and pipe along with a water spray or fire extinguisher (not supplied). 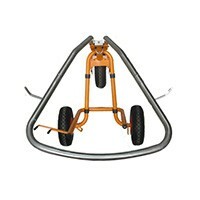 Constructed using steel tube, it is sturdy and squeezes in anywhere thanks to its compact size. 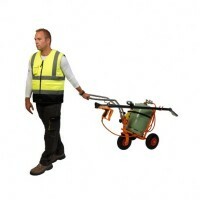 It enables long narrow areas to be treated safely, quickly and efficiently. 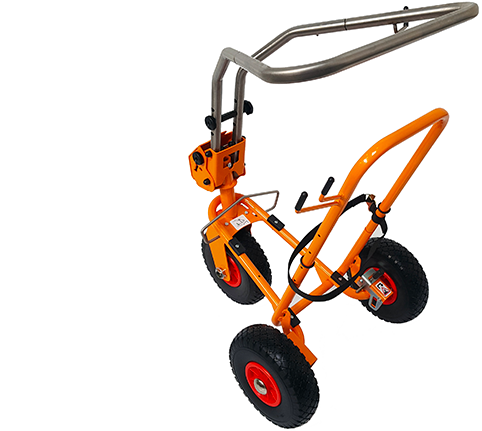 The stainless steel tiller is used to push the trolley for single-operator working or enables it to be pulled to move quickly to or from an area. A parking brake immobilises the trolley on slopes. The RIPAGREEN® thermal lance has adjustable heating power. 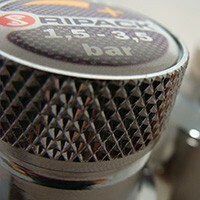 It diffuses the heat from a short and rigid flame through its stainless steel nozzle. 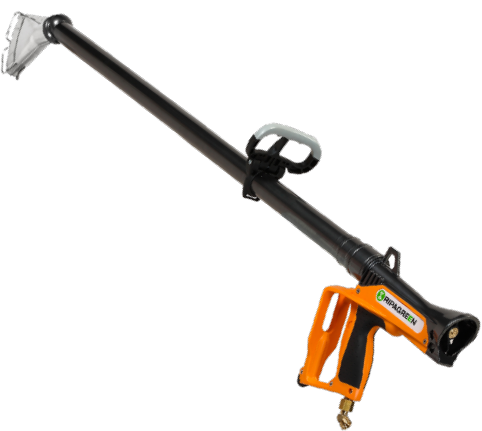 It is designed for ergonomic use by a single operator either pushed to cover large areas quickly and effortlessly, or carried to deal with complex or isolated areas. In “Two-operator” mode, the jobs of controlling the trolley and weeding using the lance are shared between two operators. The reversible stainless steel tiller allows the trolley to be either pushed or pulled providing 2 distinct positions for the thermal lance. A device allows the height of the lance to be adapted to the operator in pushed mode. The supporting frame in steel tube insures strength and lightness. 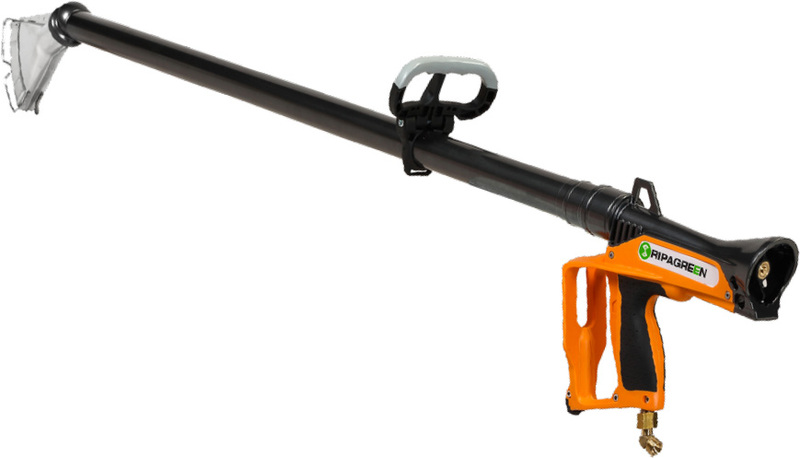 With its 12.5 kg, it allows an easy move of the gas bottle and thermal lance for your weeding operations. 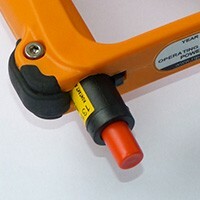 A parking brake allows the trolley to be stabilized when operating on a slope. The 3 solid wheels allow a strong stability and handiness to our Ripagreen trolley, qualities asked for a good weeding treatment. Their diameter helps for work on hard of loose ground like gravel. 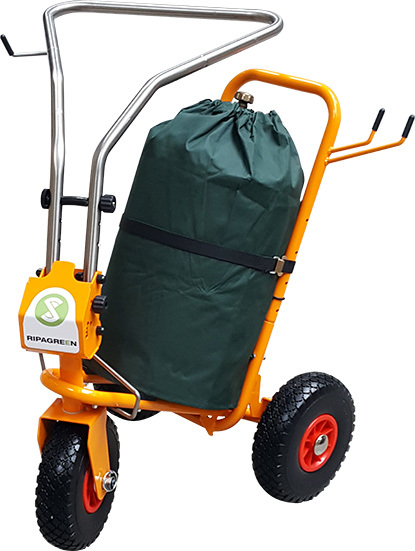 Ripagreen® trolley transports 13 kg propane gas bottle and all the equipment needed for the safety of a professional thermal weed control. No tools to set the trolley up and view space needed to park it. 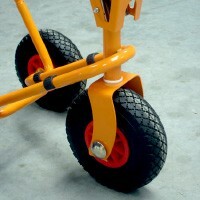 A parking brake allows the trolley to be stabilized when operating on a slope. Thanks to its low center of gravity, the Ripagreen trolley goes up without risk of fall. The gas bottle can be easily set in its tilted position. 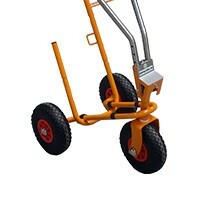 With only 55 cm wide, this trolley will follow you everywhere even on narrow path and difficult to treat weeding area. 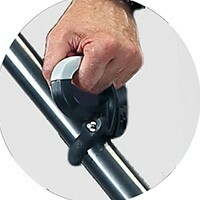 The strong and ergonomic handle with "Soft-grip" covering may be positioned anywhere along the lance to suit each operator and folds back automatically after use. The regulator is equipped with a double safety device that cuts automatically the gas supply in case of strong leak. It controls the pressure in the gas bottle in order to insure the protection of the lance in case of overheating. You can regulate the power to adapt it to your weeding area. A "click and start" system insures an instantaneous ignition of the lance. 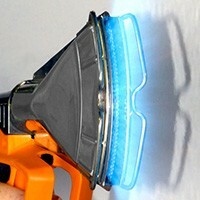 To guarantee a non-stop work, a spare igniter, changeable with no tools in seconds, is stored inside the handle. 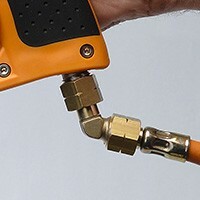 An angled swivel connector is designed to help the operator to manage the hose and insure a real comfort of use. The hot air diffuser is directional at 360° and pulsed the heat as a rigid hot blade. 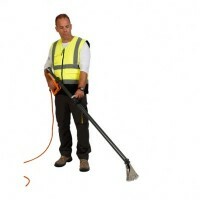 The heat produced allows weeding on 40 cm wide with precision and power.